Angie works hard to run her uncle's events business while her cousin Candace takes the credit. When Angie takes a night off to have fun at the Christmasquerade Ball, the mask and gown allow her to let loose, and she quickly catches the eye of Nicholas, a wealthy local bachelor. But then Angie has to go before revealing her identity, leaving Nicholas searching for his mystery woman in this modern take on the classic fairytale. The only thing that is working in Cassie's world is her small town business. Her Christmas Cupcakery is a huge success, but her love life is a mess. Cassie's whole universe is turned upside down when she falls in love with a co-worker who is revealed to be the famous and notoriously troubled actor Alex Gray. There's no denying that Alex and Cassie are in love, but can their relationship survive the pressure of Hollywood and the holidays? Celia Banks has given her whole life to seven-year-old daughter Lilly. After losing her husband three years ago, Celia has also given up on love... but Lilly doesn't want her mother to spend another holiday season alone. She decides to send a letter to Santa, Inc., a service that answers childrens North Pole bound mail, wishing for her mom to be happy again. When struggling childrens author Jake Platt ('Santa') receives Lillys letter, he is inspired to write for the first time in years. Once Celia reads Jakes heartfelt response, the two begin an old-fashioned correspondence and fall more in love with each letter, just in time for Christmas. Its Christmas at the Anderson's and you know what that means: parties, presents, and plenty of mingling. Everything is set up for another year of remarkable gifts until Michael gets fired from his job for being too greedy right before Christmas. Now, he and his wife Caroline will have to cancel the parties and presents for their twins Brendan and Julia. All hope for a great holiday is lost until wacky Aunt Katie randomly shows up at the house announcing shes going to spend Christmas and New Years with the family. 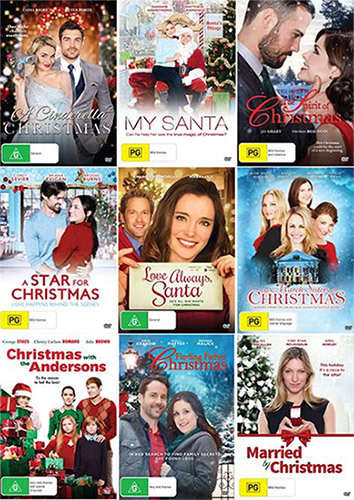 Reluctant at first, the Anderson's give Aunt Katie a chance and she soon helps them realize they can still come together to pull off an amazing Christmas without any money. With her help, they rediscover that the most important part of the holidays is the people youre surrounded by, not the presents you receive. Based on the bestselling novel by Robin Jones Gunn, 'Finding Father Christmas' is the story of MIRANDA who has spent her life avoiding Christmas because it is a painful reminder of the family she never had. Her mother died when she was young, never revealing the identity of her father. But, four days before Christmas she receives a clue to his whereabouts that takes her to a beautiful New England town. Welcomed at the Carlton Heath Inn she meets IAN, a young man who helps with her search. With Ian at her side, this Christmas promises to be life-changing for Miranda with a new chance at life and love. When it comes to her work, Carrie Tate takes herself very seriously. She has dedicated her entire life to growing Emerson Foods, the high-end food distribution company founded by her father, and doesnt have much time for a social life. Carries sister Katie, on the other hand, is a gourmet food-to-table restaurateur and marrying her boyfriend on Christmas Eve. However, due to an outdated stipulation in their grandmothers will, its discovered that ownership of the company will pass to whichever sister marries first. Now, Carrie must get married by Christmas or kiss her family business goodbye! After a series of misguided and wacky plans, she finds love in Dylan, the lawyer who should be her enemy. But with Christmas approaching and the business at stake, will Carrie elope in time or will all of her hard-earned holiday work be for nothing? *Why is Christmas your favourite Holiday?